Summer is ending. The days are cooler – finally comfortable, for me. The air conditioner is off, the windows are open, and we just dug out a light blanket for the bed. This is the most beautiful season in New York City. Many days, the sky is a deep blue, and the air sparkles. People walk with a spring in their step. It is also the peak of the harvest season. Greenmarket is overflowing. The CSA haul is starting to be mixed – the tomatoes, eggplant, and zucchini of August are still plentiful, but now they are side by side with broccoli and cauliflower. And peppers. Have I mentioned peppers? 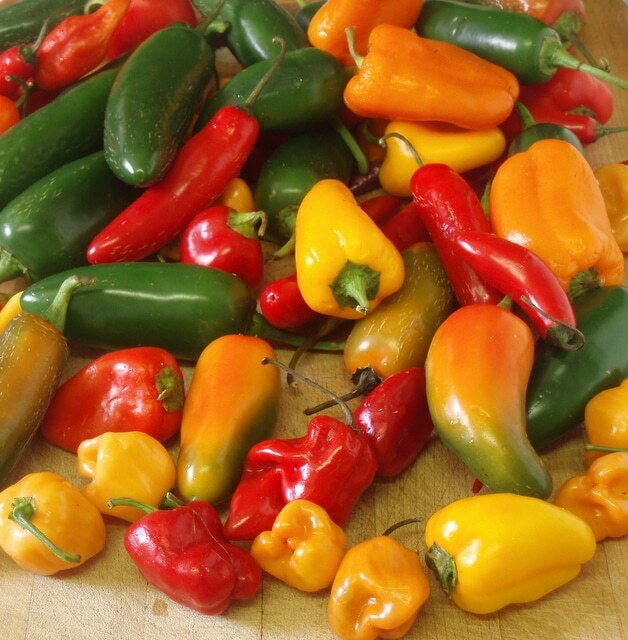 Both sweet and hot peppers are ripening, beautifully red (or orange or yellow, depending on the cultivar) and bursting with flavor. Not everyone in our CSA wants them, so there are always extras for those of us who do, and we certainly do! I’ll preserve many for the winter, in one way or another, but we’re also enjoying them now. And it is finally cool enough for hot soup. 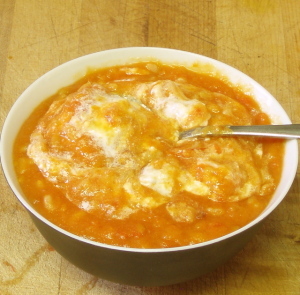 Every year, once or twice when I can get lots of hot peppers, I make this soup. 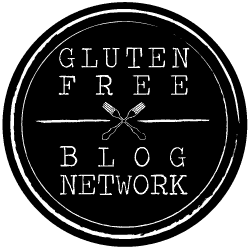 I’ve literally been making it my entire adult life, without any serious changes (which is unusual for me…) Normally, on this site, I only share recipes that are either original, radically changed from the first inspiration, or general enough that no one cook can really claim the concept. (Cole slaw? Chicken soup?) This is different. My senior year in college I lived off campus, in an apartment with another woman. She kept Kosher, and was vegetarian (which, let me tell you, is the easiest way for an Irish girl like me to keep Kosher!) and we had agreed that we would keep a vegetarian (and Kosher) kitchen. 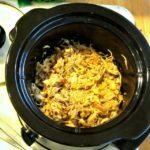 I was interested in vegetarian cooking anyway, and continued a largely, though never entirely, meatless diet for years after, and, indeed, still have many meatless meals. Along the way, my roommate introduced me to what were then the classic books of vegetarian cooking. One of the greatest of these was The Vegetarian Epicure, by Anna Thomas. I am always confused when I read statements that vegetarian cooking in the 70s and 80s consisted entirely of TVP patties and earnest but tasteless veggie loaves – that’s not what I ate! One could – we knew a guy who ate like that, and we kept having him over for dinner so he’d get some real food – but no one had to. (Just as a meat eater did not have to live on Hamburger Helper, though some certainly did.) The Epicure (as people called it) was a good cookbook that didn’t happen to include meat, and my go to for years if I wanted, for whatever reason, to serve a meatless meal to someone suspicious of the idea. By modern vegetarian standards, it relies a lot on eggs and cheese, and it barely mentions whole grains or beans, but these are not the only meals I eat… Equally, many (not all) recipes were a little fussy for a weeknight dinner, but well worth it for a special meal (even just Sunday – or Sabbath – dinner. Not too fussy for once a week.) The food is simply delicious. Thomas did write a second volume, and has written more cookbooks more recently as well, though that has never been her primary profession. This is all to say that I have literally made this pepper soup every year for decades – I think it is that good. And I haven’t really changed it. I have cut down on the fussiness. 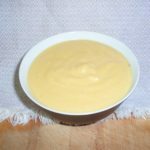 The immersion blender has made pureed soups much easier than they were – and, if I do say so myself, I do love my roux cubes… I used to have to stop everything and use a new pan to make a roux, then temper it, then… Now I just stir in the cubes and let them melt. Couldn’t be easier. It starts with a cup of chopped peppers. Remove stems, seeds, and pith – they contribute more heat than flavor, and we’re looking here for more flavor than heat. Now, the problem with volume measurements is that, the more coarsely you chop, the less pepper is in that cup – this is fairly coarsely chopped. I’m going to puree it later, so I don’t want to waste my time mincing… but you can add a little more if you like. Also, think about the heat of your peppers. There are Scotch Bonnets in the picture above, and those bad boys are not going into soup. I want to be able to eat it! (There will be hot sauce, down the road…) I prefer all red, yellow and orange peppers for this, just to avoid muddying the color. 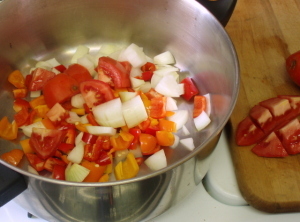 After preparing the peppers I chopped an onion, and 4 big plum tomatoes. The recipe calls for two pounds – avoiding volume measurement, here. 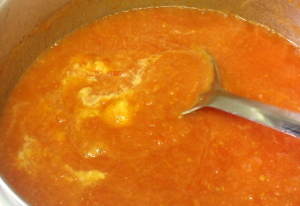 If you don’t have good fresh tomatoes, this is a place where canned will work – I’ve sometimes frozen the peppers, and made the soup in winter with canned tomatoes. Like the ratatouille base, it gives me a taste of summer, and a nice change. Good ripe tomatoes are best, though. 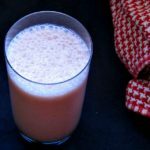 Now – the original recipe calls for putting all of this in a blender, with water, and pureeing the raw vegetables, and then cooking it all. Now that I have an immersion blender, though, I’d rather put it all in the soup pot, cook it, and then blend it – it leaves a slightly chunkier texture, which I prefer. So I put the vegetables in the pot with water, and simmered it for about 20 minutes. 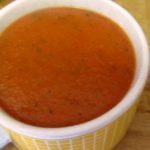 I choose to let it cool at least a little – and I did deliberately make it in a large pot to reduce spattering – and then I used the immersion blender to get the consistency I wanted. 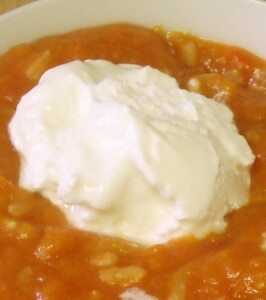 I served it then, with a dollop of full fat Greek yogurt in each bowl. 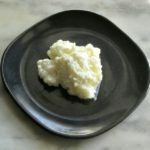 The original calls for sour cream – which is wonderful and luxurious, and which I strongly recommend if you make this for guests, or as a first course for a holiday meal. 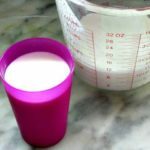 I use the yogurt partly just because I’m more likely to have it in the house – but partly because it boosts the protein if this is a meatless meal… Only do this with the full fat Greek yogurt, though – low fat regular just doesn’t really work well – it’s too thin and a little chalky. The soup has a luxurious rich mouthfeel, and you don’t want to spoil that. This is really a first course soup, not the dinner soup I so often make. Four bowls – a first course with dinner, or lunch with a salad. (We did both, with this batch.) It does double easily. So, in fact, I have changed it a little… and (looking in the book) I’ve also lost a few seasonings and garnishes along the way. By all means add lemon peel and dill if you have them around… By all means get your hands on the book. 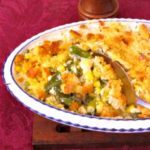 When I made her the macaroni and cheese, my grandmother sighed and said “This tastes like my mother’s.” (I told my own mother, who looked at me with respect – “My grandma made the best macaroni and cheese in the Heights.” Then she bought the book.) 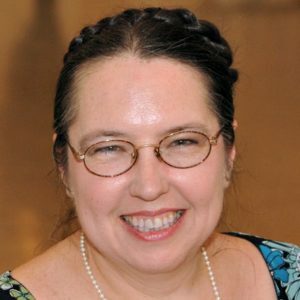 I learned to make curries without fear – or curry powder – and spanakopita, and sweet potato pie… It was a good book to have, just that first step past starting to learn to cook. I knew basics – this introduced me to the glory that good cooking can be. 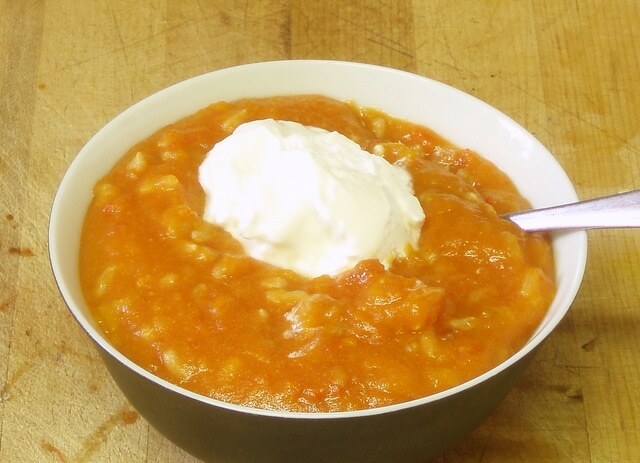 A delicious hot soup of fiery peppers and rich, ripe tomatoes - wonderful on the first cool days. Place the chopped vegetables and water in a soup pot. Bring to a boil, and simmer for 20 minutes. Reheat the soup. As it heats, add Roux Cubes and stir as they melt into the soup. As it heats and starts to thicken, add the cooked rice. 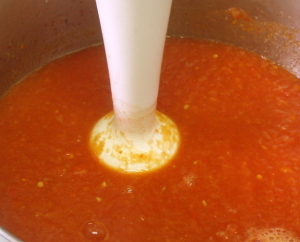 Let it simmer 2-3 minutes, until it is completely hot, and has thickened. I hope you enjoy it! 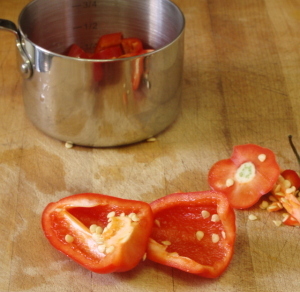 The heat varies a lot, depending on the peppers you use.